ONE OF Dickens s great characters is Wilkins Micawber, in David Copperfield, who was wont to say something will turn up , and it appears as though such sentiments are at work still in Government thinking on the banks. Eighteen months into the crisis in the Irish banking sector, and astonishing as it may seem, no real effective repair action has yet taken place. Not a single impaired loan has been taken off the books of the banks. Instead, Government handling of the banking system has been marked by an unwillingness to face up to this fundamental problem the banks are effectively bankrupted by the losses that they face on speculative lending. The National Asset Management Agency (Nama), as structured, is designed to buy time for the market, somehow, to sort it out, as there is an ideological obsession at the heart of Government against the notion of the State as the majority shareholder in the banks, even if required and even if temporary. But events may force their hand. Recall that Nama will in essence take off the banks the loans secured on now deflated bubble assets. The idea is that, in extremis, Nama can sell the assets for their long-term economic value and recoup some of its outlay. 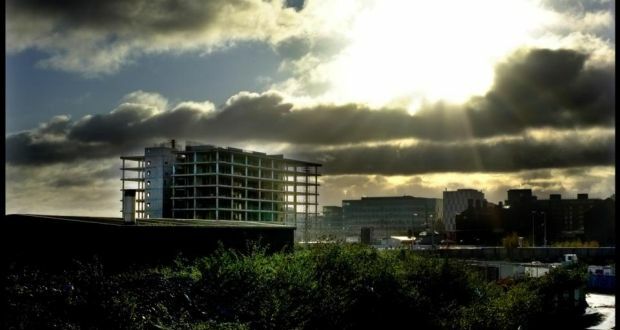 Nama is proposing to take over some EUR 33 billion of land and development loans in Ireland alone. Recently it has been suggested that a major problem exists, in that in many cases of development land the title was not actually transferred to the developer; rather, they took out a licence to develop. This was, it seems, a scheme to minimise tax, but it leaves open the incredible scenario that rather than being secured on an asset, these loans were secured on what is technically a derivative whose value has now collapsed to zero. If the underlying assets are worth zero, the hole in the banking system is that much larger. The most public face of the creeping failure of Nama is the forced involvement of the State in Bank of Ireland. As part of the initial plan to prop up the banks the State issued AIB and BoI with EUR 3.5 billion in exchange for preference shares. While these did give voting rights and a warrant to take shares, they did not in and of themselves confer any direct ownership. The dividend on these was to be 8 per cent, some EUR 250 million. However, the EU has stopped the banks from paying any forms of dividend when they are in receipt of State funds, as otherwise we would see a direct and transparent transfer of money from the State to private individuals. The effect of this was to force the State to take shares worth EUR 250 million, some 16 per cent of Bank of Ireland, in lieu. As late as last week the State was still in Micawber mode, with the NTMA and the Department of Finance ignoring this and hoping that something would allow the State to take the money and/or defer payment and/or . . . something, anything, just not to become a shareholder in the bank. The ideological obsession with non-State ownership has been driving the Nama plan all along; but the Rubicon has been passed the State is owner of a large chunk of Bank of Ireland. The Government hopes that by the time AIB has to pay its dividend in early May, something will turn up that will allow the State avoid taking shares. That something is hoped to be the EU finally approving Nama; but it is not at all clear that even then the EU will allow the banks to resume dividend payments. While the markets will have factored in some probability of the banks shares being diluted by the requirement to issue more shares to pay the dividend, the trajectory for Irish bank shares is probably downwards. The market value of the two main banks has fluctuated around the EUR 1.2-1.5 billion mark. A minimum of EUR 3-4 billion extra is probably required in capital by each. With even more stringent international capital requirements looming, with the overhang of the warrants attached to the preference shares and with the banks toxic loans not yet cleaned, the likelihood of gaining this money from the private sector is slim. That will leave the State as the only source. Herein lies a bad joke the State, when it steps in further to take shares in the banks, will have to dilute its existing shareholdings gained by the share dividend payment. In saving the banks it will destroy the value it has now taken. Two subsequent issues then emerge. 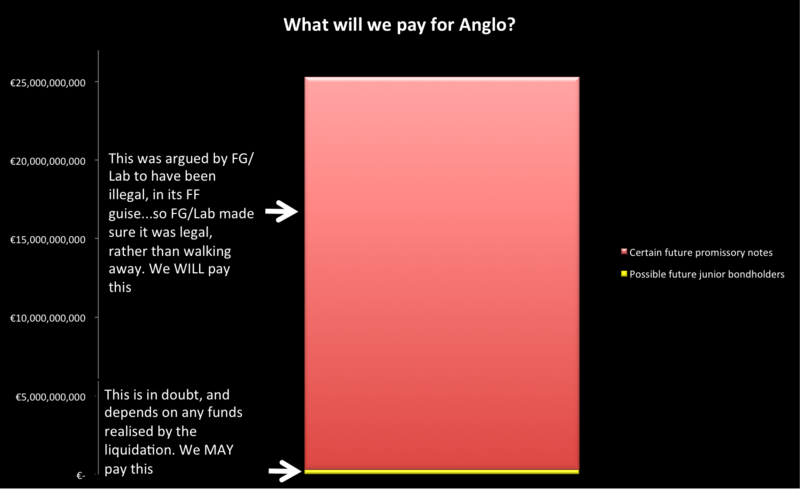 First, where will the State obtain this money to recapitalise the banks (leaving aside the financial black hole that is Anglo, which may require EUR 10 billion more merely to stay in its present zombie state)? We face several years of fiscal stringency and it will be a hard sell for any minister for finance to say, in effect, that the taxpayer needs to bail out the banks further while themselves being taxed more for less services. Second, throughout the banking crisis a deliberate and calculated rhetorical device has been employed: Iceland nationalised its banks; Iceland is in deep trouble. This is an argument known as post hoc, ergo propter hoc (a happened after b, therefore a was caused by b). Iceland was in such trouble that it had to nationalise its banks. If we are now forced to nationalise the banks how can the Minister say we are not in massive trouble? But how can we avoid this reality and should we? Micawber, we should recall from reading David Copperfield, ended up in the clink because he did not face reality. Nationalisation, or majority State-share ownership, is firmly back on the agenda. Something has turned up, but it s not what the Government wanted. This entry was posted in Blogpost, Journalism and tagged academics, Anglo, banking, banks, economy on August 12, 2013 by brianmlucey.